WATCH: European Jewish leader warns Europe's immunization to anti-Semitism is ending as Holocaust memory fades. 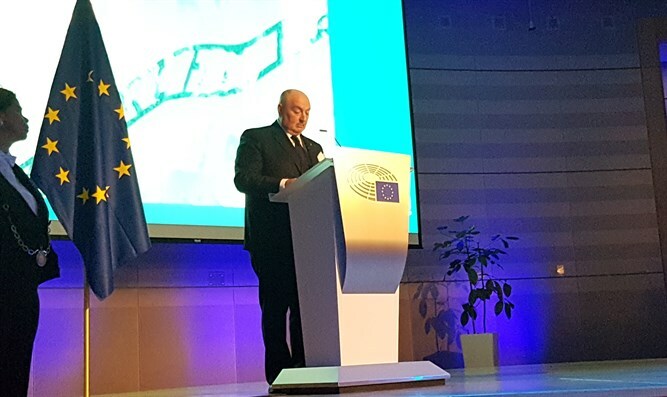 European Jewish Congress President Dr. Moshe Kantor has warned that with the fading of direct Holocaust memory, Europe is no longer immune from anti-Semitism. The European International Holocaust Commemoration Day event was attended by leading European Union officials, leaders of Europe’s Jewish communities and diplomats. Keynote addresses were delivered at the event by First Vice President of the European Parliament Mairead McGuinness and EJC President Dr. Moshe Kantor. For the first time, this year’s commemoration marked both the Holocaust of six million Jews and the Genocide of Roma populations at the hands of the Nazis and their collaborators. In his speech, Dr. Kantor noted the discrimination still faced by Roma, homosexuals and the disabled, all of whom were targeted by the Nazis, still within living memory. Other speeches at the event were given by Knesset Speaker Yuli Edelstein (Likud), Parliament Vice President and Rapporteur on EU Roma Strategy Lívia Járóka, and Rapporteur on Roma Fundamental Rights Soraya Post MEP. The European Jewish Congress is the democratically-elected representative organisation of European Jewry.